Matudnila.com - A Cebu Events Blog: MusicFest 2010 featuring Boyce Avenue and Kris Allen at SM Cebu! Home SM northwing Event MusicFest 2010 featuring Boyce Avenue and Kris Allen at SM Cebu! 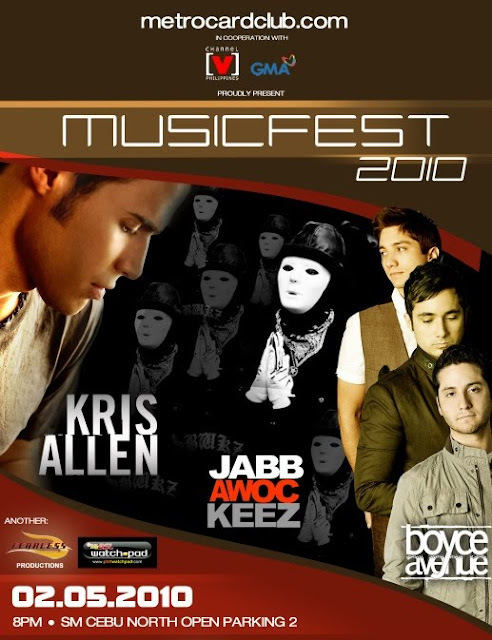 MusicFest 2010 featuring Boyce Avenue and Kris Allen at SM Cebu! Just in time before Valentines Day. Cebu's new and internationally-twisted Event, Metro Card Club in cooperation with Channel [V] Philippines, GMA 7 and PLDT myDSL WatchPad presents Metrocardclub.com MUSICFEST 2010, February 5 @ SM Cebu North Open Parking. Featuring American Idol Season 8 winner KRIS ALLEN, Randy Jackson's America's Best Dance Crew Winner JABBAWOCKEEZ and Florida-based band popular for its strong acoustic roots with their own version of hit songs: Umbrella, Apologize, Hate That I Love You and With You BOYCE AVENUE. MusicFest 2010 featuring Boyce Avenue at SM Cebu! posted on Cebu Events Blog. 0 comments: on "MusicFest 2010 featuring Boyce Avenue and Kris Allen at SM Cebu!"